I must admit, I’ve been a bit too focused on Hurricane Irene in the past few days to post anything, but now that it seems to have passed NYC, without the levels of destruction we feared, I thought I would draw attention to a nice story that came out yesterday in the NY Times: A black South African woman — Ntsiki Biyela — heralds from a poor, rural area of Kwazulu-Natal, where she had no previous exposure to wine. Nonetheless, she is emerging as a world class wine maker, having won a fellowship to study the trade in a country known for its spectacularly beautiful wine country, world class production, and an unsavory history of labor relations on vineyards. I must admit, that as apartheid was crumbling in the early 1990s, this was the type of story that I had hoped to see more of: Black South Africans being trained in professional skills to take advantage of the country’s fantastic natural resources, and the infrastructure that had been built on the edifice of apartheid. To date, too much ‘black business empowerment’ is at the level of finance and holding companies — in which politically connected individuals secure access to windfall gains through sheer accounting procedures, but little in the way of real value added. Biyela’s story demonstrates something different — the untapped potential of individuals to seize opportunities in a range of industries, such that ordinary black Africans can take advantage of South Africa’s privileged position in the regional and global marketplace. It is a story worth reading. 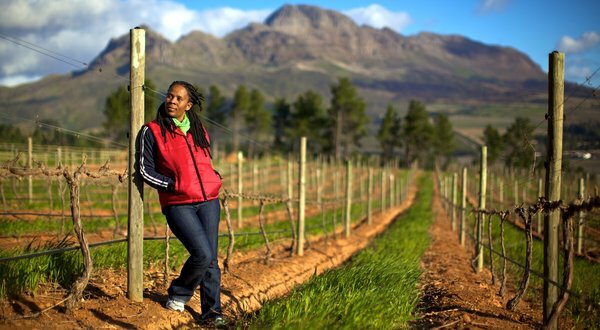 While not everyone can be a gold medal winning winemaker, the incubation of productive skills and talents ought to take a higher priority on the South African agenda. Thanks for sharing superb information. Your site is so cool. I am impressed by the details that you’ve on this web site. It reveals how nicely you perceive this subject. Bookmarked this website page, will come back for more articles.